Starters and Snack to boost your Calcium, Indian Calcium Rich Starters. Goodbye hunger, welcome excitement! These calcium-rich starters and snacks are perfectly designed to quickly answer your hunger pangs in a way that answers your daily calcium requirements too. Here, you will find a great variety of delectable snacks, which are so appetising and flavoursome that they will surely steal your heart. Buckwheat is a super food for Vegetarians. We have got you Buckwheat Dhokla used during Fasts. Then there is Buckwheat Pancakes which are also good for Daibetics and the super healthy Buckwheat Dosa which is had as a office snack at Tarla Dalal. Nanchi is also Calcium Rich and super healthy. You could have the Nachni Pancakes or try it with Paneer. Our favorite Dinner snack or we almost make a meal out of Ragi Roti stuffed with Paneer. Make a dosa calcium rich. This Nachni Dosa is super tasty and way healthier than the regular dosa. Then there is the Ragi Uttapa which is Protein rich also. The Paneer Spring Onion Wrap is made from Soya flour. Then there is the Methi Monng Sprouts Warp which is also Fibre Rich and good to lower blood pressure. Then there is the famous Paneer Tikka Kathi Rolls whose marinade is curd based and chapati made of whole wheat. 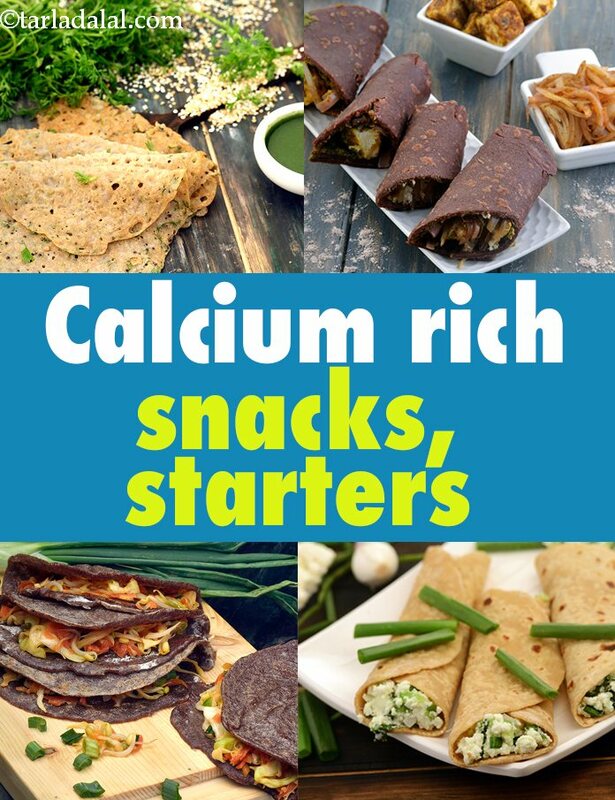 Enjoy our collection of Starters and Snack to boost your Calcium, Indian Calcium Rich Starters given below from Calcium Rich Breakfast to Desserts. True to its name, this tikka will melt in your mouth and delight your palate! replacing the fat-laden white gravy of cream and cashews with whole wheat bread mayonnaise results in a healthier version, which you can serve in portions of two pieces. Step-by-step, this recipe will trigger all your good senses… because, not only is the paneer marinated in tangy green chutney, it is also layered with a spicy corn mixture. A filling snack that is an ideal choice when your kids come home hungry from school. They are sure to love the gooey, cheesy mixture interspersed with mildly sweet corn. You will be satisfied with this snack too, as it provides your precious ones with much-needed calcium in their growing phase. These savoury waffles are bursting with the goodness of ingredients like moong dal, fenugreek and paneer. Experience the benefits of protein, iron and calcium packed in this dish!